Through October, we continued to have light traffic at our feeders, but plenty of birds deeper in the woods. Great insects, fruits, berries? Could be. 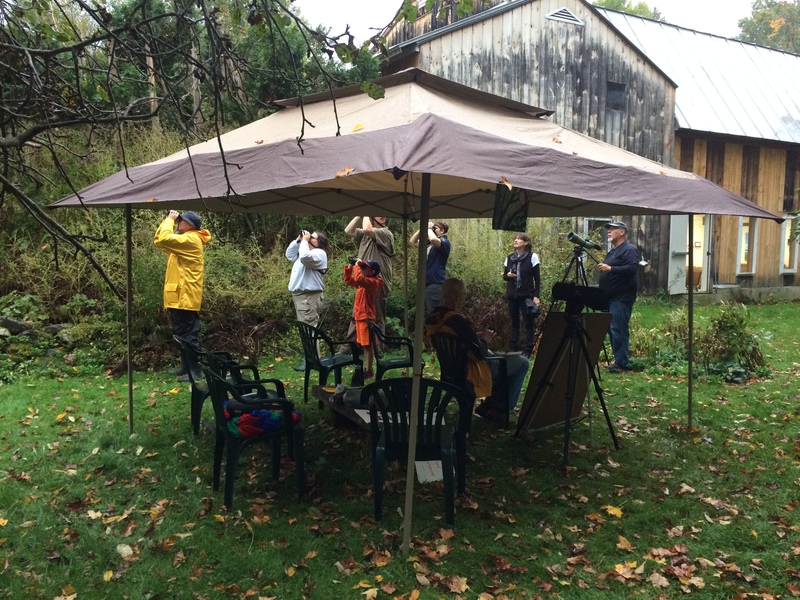 This month’s list includes what we observed at the Big Sit!, one of our favorite birding activities. Bold items in this list are those species not recorded in September 2017. Some Big “Sitters” who moved out from under their canopy… but not outside their 17-foot circle! Photo by K. Talmage © 2017 and used by permission. This just goes to show if you get out past the windows from dawn to dusk, you can be rewarded! Find out a bit more about our Team Loonatics on the BigSit! website. Seven Days came out and filmed for a Stuck in Vermont segment; thank you! And for the first time that we know of, Vermont has two circles! Friends of the Missisquoi sat also. Find out a bit more about our Team Loonatics on the BigSit! website. Seven Days came out and filmed for a Stuck in Vermont segment; thank you! And for the first time that we know of, Vermont has two circles! Friends of the Missisquoi sat also. Maybe you will form a circle next October? As I post, we’ve just entered our “by appointment” season. From November to April, please call ahead to schedule your visit; we usually need several days notice. We continue to host walks, carvings classes, and more through the winter, listed on our events page. If you follow us on Facebook, Twitter , tumblr, and/or Instagram too, you’ll find more comments, links, and observations. See you soon! This entry was posted on November 3, 2017 at 2:28 pm and is filed under Birding, Viewing Window, Wild Birds and You. You can subscribe via RSS 2.0 feed to this post's comments.